I’m kicking off the event with my all-time favorite genre: historical fiction! If you’re new to this blog, you may not know I have a PhD in fashion history! If you love historical fiction too, then join me on Monday, January 14th at The Novel Neighbor to hear my top 10 historical fiction picks for 2019. Next up is biographies and memoirs! 2018 saw some epic biographies and memoirs (ahem, Becoming by Michelle Obama and This Will Only Hurt a Little by Busy Philips…to name a few.) So what does 2019 have in store for biographies and memoirs? Stop by The Book House on Tuesday, January 15th at 7pm to find out! On Wednesday, January 16th we are heading to my local bookstore, Main Street Books to discuss mysteries and thrillers coming out in 2019. Who doesn’t love a good page-turner that keeps you in suspense to the very end? In 2019 we will see mysteries and thrillers by authors we already love as well as some debut authors! 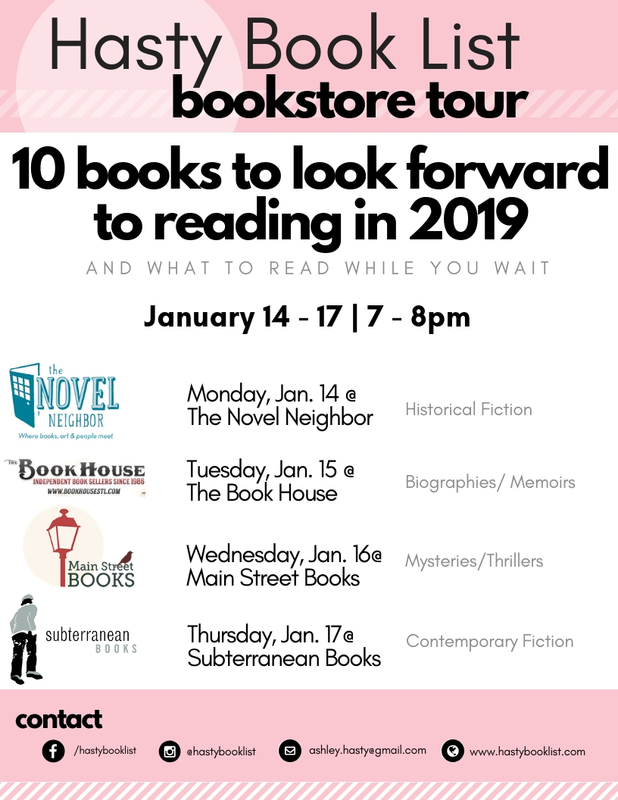 Last but not least, we are visiting Subterranean Books on Thursday, January 17 for my top 10 contemporary fiction books coming out in 2019. This will be a combination of literary fiction, chick lit, and everything in between. If it takes place in contemporary times it qualifies. But I’m narrowing it down to just my top 10! If this is your favorite genre, don’t forget to stop by! NOTE: This is a risky time of year concerning weather. Please pay attention to our Facebook Event for more information about changes/cancellations if the weather is looking bad.